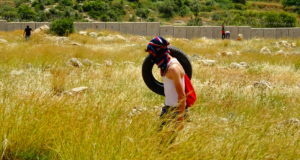 On the 1st July, the village of Ni’lin again forced construction on the apartheid wall to halt. Bulldozers and other machinery were also damaged. Afterwards, it was decided to march on another site at which the wall is being constructed. This time troops responded aggressively before the site could be reached, firing tear gas canisters directly at demonstrators and throwing sound bombs. Hot tear gas canisters started fires amongst the olive trees which spread quickly. 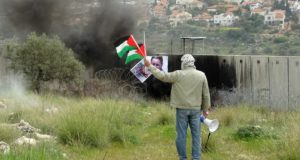 Protesters attempted to control the fire while Israeli forces continued to fire tear gas and rubber bullets. A fire engine eventually managed to reach the area but not before at least fifteen trees were burnt. 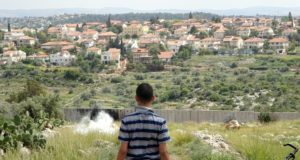 The village of Ni’leen is about to lose approximately 2500 donums when the construction of the apartheid wall is finsished. From having over 57 000 donums in 1948, the village has seen its land decrease to 33 000 donums in 1967 to about 10 000 donums at the present time. The villagers fear that the next annexation will be the death blow to the village’s economy. Organisers of the demonstrations are therefore adamant that the village will continue the demonstrations.